Use fall flowers to add a splash of color to your landscape. Fall is an exciting time of the year! There is Halloween, Thanksgiving, and lots of football. If you want to enhance the appearance of your landscape this fall, you have come to the right place. We have compiled a list of some of our top recommendations for doing just that! With that said, keep reading and discover a few steps you can take to enhance your property’s curb appeal this fall! Fall is arguably the most colorful time of the year. It features a blend of beautiful colors like reds, oranges, and yellows. Most people associate flowers to the spring and summer seasons; however, there are plenty of flowers that you can incorporate into your landscape this fall. 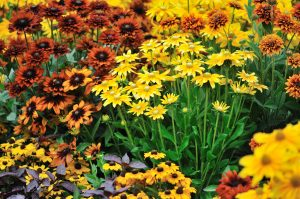 Some of which include Chrysanthemum, Black-Eyed Susan, Russian Shade, Sneezeweed, and Coneflower. During the fall season, be sure to clean out your home’s downspouts and gutters. Ridding them of debris and leaves will protect your home from water damage. Also, it helps to protect the foundation of your property. Our gutter cleaning services at JFK Lawn & Landscape can help prevent thousands of dollars of damage to your residence. We provide thorough gutter cleaning for commercial and residential properties. Your home’s entryway is one of the first things people see when pulling up to your home. If your aim is to enhance your curb appeal this fall, take some steps to improve this part of your property. In terms of cleaning, you may want to sweep off the stoop or wash off the front door. Other measures you can take include replacing rusted hardware, laying out a new and welcoming doormat, or putting out a few festive decorations. Before you know it, daylights saving will be here! If you want your home to look more inviting during the evening hours, landscape lighting is your best bet! Landscape lighting will allow you to highlight certain areas of your property during the evening hours. It will also make your landscape safer at night it you use to it to illuminate steps and walkways. This entry was posted on Monday, October 1st, 2018 at 4:11 pm. Both comments and pings are currently closed.